Property 2: Perfect location, south facing private pool, air con, TV & WiFi. Property 12: Detached Villa In Cul-de-Sac With Private Pool And Sea Views & Free WiFi. Property 21: Luxury Villa With Private Pool offering 3 bedrooms & 3 bathrooms & Privacy. 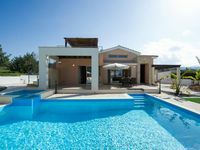 Property 25: Luxury Detached Villa In Central Coral Bay With Private Pool - Car Not Required. Property 30: Detached Villa, Private Pool, WiFi Included, All Amenities close by. Property 40: NEW! Luxury 8 bed villa with magnificent roof terrace, 100m from the sea. 3 Bed Villa,very large fully enclosed plot,outside covered kitchen! Property 46: 3 Bed Villa,very large fully enclosed plot,outside covered kitchen! We arrived late in the afternoon and were very impressed with the villa and surrounding area. We felt very relaxed, the beds were extremely comfortable and the villa spacious. Sitting by the pool with fruit trees all around us was an added bonus. A perfect peaceful holiday.